Philippines - October 2009 - Ozone is an environmentally friendly alternative to many semiconductor process chemicals. It is one of the strongest oxidants, can be generated at the point of use and easily converted back to oxygen. Typical ozone applications include wafer cleaning, photoresist strip, contaminant removal, surface conditioning, oxide growth, among others. 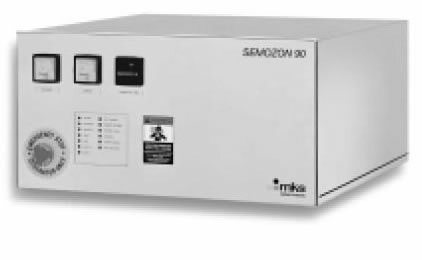 The MKS, ASTeX Products SEMOZON TM ozone generator is a high concentration, ultra-clean ozone source designed for use in semiconductor fabrication. The generator converts pure oxygen into ozone through silent electrical discharge and achieves highest output concentration levels. High purity materials such as the electro-polished stainless steel plumbing and an extremely low requirement for dopant gas ensure high purity ozone. The generator may be controlled remotely with connections for on/off, operation, output power, and alarms. Together with the optionally available Ozone Control Units, the SEMOZON generator can be combined into a fully independent closed loop controlled ozone system.